Cool Website: Tattoo Font Maker Makes Ink Design Easy! There are a lot of great resources on the internet to help you decide on a new tattoo. I recently discovered one called Tattoo Font Maker that is one of the best resources I've found online to help with tattoo design. This name of the site only scratches the surface of what it can actually do for you as someone looking for a new tattoo. Fonts and text are only one of numerous designs that are available to download and experiment with. One of the most frustrating things for tattoo artists is not understanding what the customer really wants. Now someone can walk into a shop fully prepared with a design in hand, a great tool for both you and your artist in knowing what it is you really want on your body. The website, Tattoo Font Maker, comes with a fully-loaded editing tool called "Tattoo Builder" that allows you to play with fonts and designs, and place them on your own photo, which you can upload and build into the generator. You can also utilize a full library of inspirational and memorable quotes, dozens of basic designs, and pages and pages of downloadable fonts. Once you've designed your tattoo, you can share your creation on social media, if you like. What's truly remarkable is that this resource is completely free. It's hard to beat that! Whether you are someone looking to design their first tattoo, or a tattoo artist looking for a platform to help you with designing, the Tattoo Font Maker is a valuable tool that can make the process fun and exciting. Be sure to head over to Tattoo Font Maker (http://www.tattoofontmaker.com/) to check it out and get started on your new tattoo! A year ago today, our family was shocked to learn that our cousin Beth had passed unexpectedly over night. Although she was my wife Melanie's cousin, Beth's personality and caring nature had endeared her to me and to m y children, as well. But that was who Beth was, she drew you in. She cared. She was family. 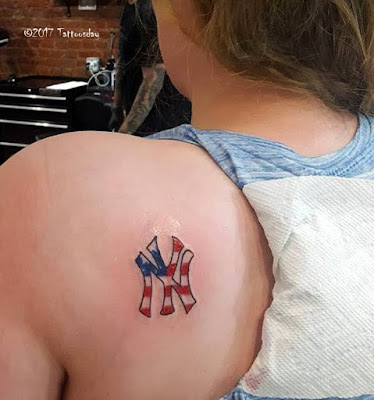 Beth and I bonded over tattoos and she first appeared on Tattoosday in 2011 in this post that featured a Yankees logo shaded with the stars and stripes. 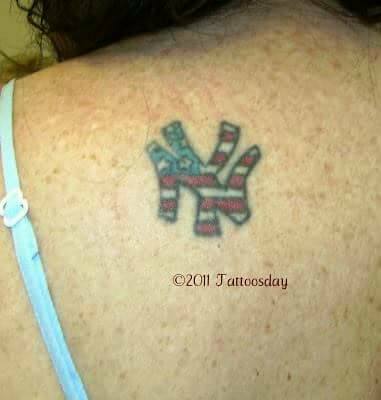 Last year I had taken a photo of her most recent tattoo, but didn't post it when she was still alive. But when I did post it at the end of the year, I was able to follow it the next day with my wife Melanie's lovely tribute tattoo for her here. My younger daughter, Shayna, was a kindred spirit with Beth, as their love of the New York Yankees was a common thread that they shared. Shayna turned eighteen earlier this year and did not wait long to get her first tattoo. Shayna's tattoo was inked by Alex McWatt from Three Kings Tattoo in the East Village. Shayna sat like a champ, as they say, and I know that Beth would have been proud of her and tickled to see her honoring her this way. She was taken from us too soon. We have the memories, but Melanie and Shayna also have the tattoos that serve as tributes for our cousin who lit up the room with her smile and brought everyone together. I met Jose last week in the vestibule of a bank in Bay Ridge, Brooklyn. Jose's half-sleeve is a tribute to his Puerto Rican heritage. He says he wanted "something different" and his artist combined several elements that are part of Puerto Rican life that represented his culture. The flag flies at the top of the tattoo and the hibiscus blossoms give the tattoo its floral pop. The iguana sits regally at the bottom of the tattoo and, if you look closely, on the inner part of the tattoo is Puerto Rico's coquí frog which is another symbol of the island commonwealth. Jose's artist was Tazz (@tazz_tatts) from Aztec Ink Tattooing & Piercing Studio (@aztecinkbrooklyn) in Brooklyn. We've featured Tazz's work at least once before on Tattoosday and it's always good to see new work from old friends! Thanks to Jose for sharing his cool tattoo honoring his Puerto Rican heritage with us here on Tattoosday!